An invite-only event, the FinTech Ideas Festival was held in San Francisco earlier this week, featuring influencers from some of the most innovative players in the financial services industry: Google, Paypal, Visa, Mastercard, Bank of America, CitiVentures, Microsoft and naturally, IBM. 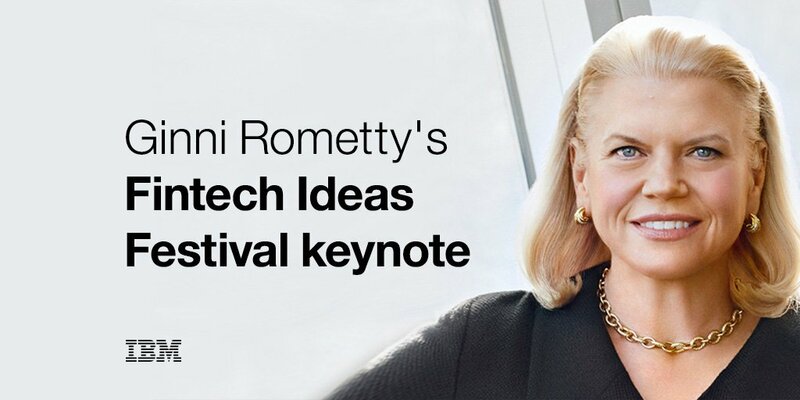 IBM CEO Ginni Rometty kicked off the event with a keynote focused on cognitive business, recent developments with blockchain and the future of finance. With intensifying frequency, we are hearing about blockchain and its massive potential to transform nearly every industry, especially financial services. Citing her WSJ op-ed piece from December, Rometty talks about how blockchain will transform your life, and even the world, just as the internet did. It’s important to remember that when we talk about blockchain, it is not as an anonymous cryptocurrency (bitcoin). Rather, it is the technology underneath it that allows for you to have a trusted exchange of nearly any type of asset. Back when the internet was emerging, there was a consortium created to agree on standards. It’s how HTML emerged. The same thing is happening with blockchain with the The Linux Foundation’s Hyperledger Project. IBM was one of the founding members of the Hyperledger Project, donating 44,000 lines of blockchain code to what became the first project under incubation, Hyperledger Fabric. The Hyperledger Fabric is built from the ground up with dozens of open source contributors, intended to be applied across many regulated industries and use cases. So what is the art of the possible? For global supply chains alone, this could lead to over $100 billion in benefits and cost savings. Include other key industries and use cases around provenance, tracking, etc and you’re looking closer to hundreds of billions. Just this week, a partnership was announced with DTCC, who selected IBM to provide a distributed ledger technology framework to drive further improvements in derivatives post-trade lifecycle events. Read this release more about the announcement. Find out what else Rometty had to say about the future of blockchain and finance by viewing her keynote below. For more information on what this technology can do for business, visit IBM Blockchain.